The camera is nearly as big as her face, obscuring her expression. But her intense curiosity, that’s plain as day, clearly visible. And there’s no hiding that this young girl — in her blue, polka-dotted Minnie Mouse dress — is adorably cute. Crouched beside her is Ken Harper, a professional news photographer and Newhouse School Multimedia Photography & Design professor. He’s on his knees, at her level, at once trying to see the photo the young girl is composing, while focusing the lens and, no doubt, trying to ensure his camera doesn’t suddenly crash to the ground. 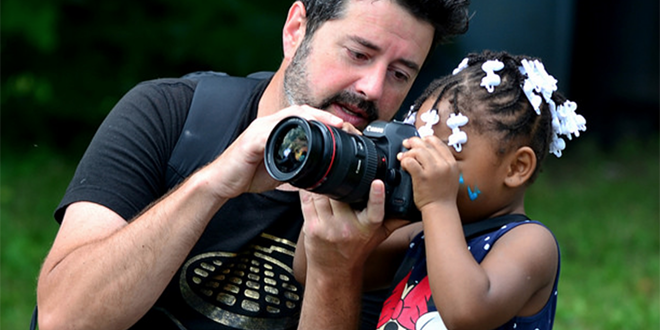 It’s impossible to pick a favorite photo from The Stand’s Ninth-Annual South Side Photo Walk. We ended up with thousands of images from dozens of photographers after attracting the Photo Walk’s largest-ever turnout, thanks to a new grant, amazing partners, expanded programming and the tireless work of Ashley Kang, The Stand’s director. But the image of Harper and the girl, her face buried in the camera, comes awfully close to being my favorite. One reason why I like it so much: It was captured by Dustin Bratcher, the managing editor of The Ohio County Monitor, which does an extraordinary job of covering a poor county in Kentucky that rarely gets mainstream media attention. Bratcher was one of two out-of-town guests who came to Syracuse to take part in the Photo Walk, along with Ina Daniel, a German public broadcaster who makes powerful documentaries about immigration and displacement. Like Kang and The Stand, Bratcher and Daniel are part of projects that won Finding Common Ground grants. 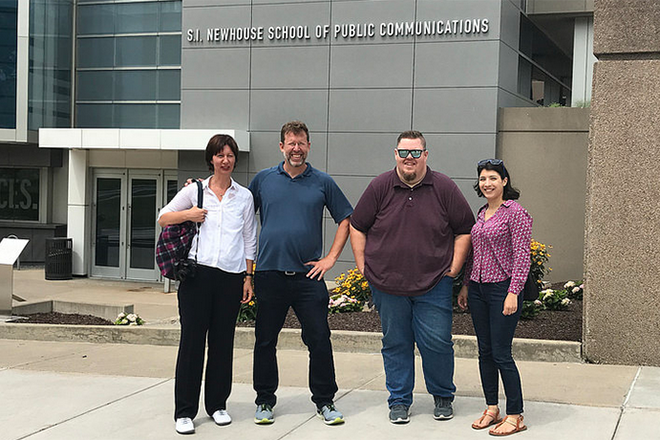 Two Finding Common Ground Grant winners visited Syracuse in July to participate in The Stand’s Ninth-Annual Photo Walk. Pictured: Ina Daniel, Greg Munno, Dustin Bratcher and Ashley Kang. The grants — funded by the Robert Bosch Stiftung (“Stiftung” is the German word for “Foundation”) and administered by the University of Oregon’s Agora Journalism Center — help pay for journalism projects that feature community engagement, like the Photo Walk. The Stand is using the grant to expand the Photo Walk. This year, it allowed us to better advertise the event, one reason we packed the house despite clouds that threatened, but that thankfully only squeezed out a few drops of rain. The grant also allowed us to buy new loaner cameras and for Tunura’s Homemade Specialties to cater a lunch for the day’s participants that included delicious empanadas. It allowed us to occupy a great space, the Eat to Live Food Cooperative, and to enjoy the graciousness of Babette Baker, an Eat to Live board member who unexpectedly helped us set up, host and tear down the event. And allowed us to print and hang photos from the event at a free and public gallery show. Daniel and Bratcher used some of their grant money to come visit us and to see how we roll here in Syracuse! Bratcher has already reported back to us that he is planning a Photo Walk in his community. So, for me, the Bratcher photo of the girl and Ken Harper has it all. It is a gorgeous image that demonstrates how the Photo Walk can build bridges and connect people who might not otherwise meet. Harper is a professional photographer with an emphasis on professional. But here he is as the subject of a photo, teaching a girl who doesn’t yet look old enough to go to school. And the poignant image of the two Central New Yorkers was captured by a stranger, from Kentucky, who wants to take what he learned on the South Side of Syracuse home with him, to his under-represented community. That’s the power of the Photo Walk. I want to personally thank all of you who participated, volunteered, funded or otherwise supported this event. And I especially want to thank all of you, the people of the South Side, who took photos at the event or allowed themselves to be photographed. Your warmth and generosity in welcoming our guests makes the Photo Walk so special each summer. Please join me in viewing these spectacular photos in this issue; at our gallery opening set for 6 p.m. Thursday, Sept. 6, at the Nancy Cantor Warehouse; online, and on permanent display at five local community centers and businesses.